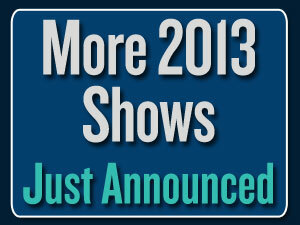 We just added nine new shows to our 2013 concerts calendar. Emmy winning comedian Dana Carvey was a repertory member of … More Dana Carvey info. Since forming in 1967, Chicago has become one of the best-loved … More Chicago info. Scores of talented singers, dancers and musicians entertained … More Stars of Lawrence Welk info. The music of Kenny Vance and The Planotones is influenced by the sounds … More Kenny Vance & The Planotones, The Duprees & The Classics info. Brothers Larry, Steve, and Rudy Gatlin started singing together … More Larry Gatlin & Brothers and Ronnie Milsap info. This all-star, crowd-pleasing lineup includes The Turtles featuring Flo & Eddie, Chuck Negron, Gary Puckett, Mark Lindsay and Gary Lewis … More Happy Together info. It’s an evening of fun and nostalgia when Paul Revere & The Raiders, Mary Wilson of The Supremes, The Association, and Mitch Ryder … More Where The Action Is info. Barbara Fairchild, Norma Jean, Jeannie C. Riley, Jan Howard, Ava Barber, Leona Williams, and Jett Williams are the incredible country … More The Ladies Night Out info. Continuing AMT’s long tradition of outstanding … More Fall Doo Wop Cavalade info. We also have concerts by Frankie Valli & The Four Seasons, Heart, Kenny Rogers, and Gaither Vocal Band. Complete list of our upcoming shows. AMT Members can purchase tickets before the general public. American Music Theatre is a 1,600-seat theatre in Lancaster, Pennsylvania that hosts more than 300 live concerts and performances each year: from Broadway shows to rock concerts and comedy club performers to today’s hottest country music concerts. We’ve welcomed Grammy winners, CMA winners, Tony winners, and even Oscar winners to our stage. No other theatre in central PA offers a wider variety of live music, country music, Broadway shows, and comedy performances, year in and year out. We hope you take the opportunity to catch a show in the comfort of one of Pennsylvania’s premier venues for live entertainment. Welcome to American Music Theatre, and enjoy the show!